Ross S. Ward was born on 16 November 1892 in Texas, twin of Rex. Oscar Zenella Ward and Martha A. Moore appeared in the US federal census of 1 June 1900 in Navarro County, Texas. Other members of the household included Ross S. Ward, Mary Lela Ward, Ola F. Ward, Blake Zenella Ward, Will Jay Ward, Oscar Arthur Ward, Walter W. Ward, John Herbert Ward, Rex H. Ward and Lois Irma Ward. Oscar Zenella Ward and Martha A. Moore appeared in the US federal census of 15 April 1910 in Hardeman County, Texas. Other members of the household included Ross S. Ward, Mary Lela Ward, John Herbert Ward, Rex H. Ward and Lois Irma Ward. The following appeared on 5 April 1911 in The Corsicana Daily Sun: (Chigger Hill) Mr. Walter Ward, Miss Etta Freeman, Mr. Ernest Huff, Miss Lois Ward and Mr. Ross Ward, all of Zion's Rest were the guests of Miss Cora Castalow of Chigger Hill Sunday afternoon. 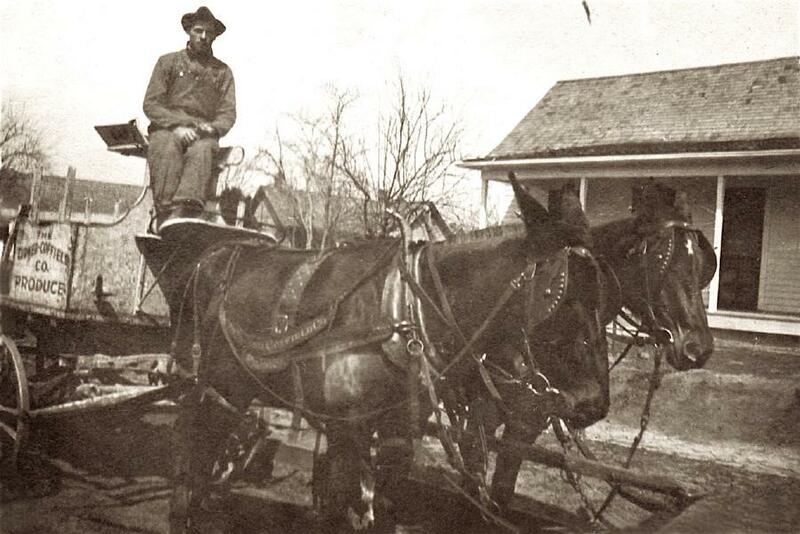 Ross Ward was photographed as a young man aboard a Turner-Coffield Company produce wagon. He married Cora Mae Fife, daughter of Oliver Robert Fife and Julia Frances Smith, on 31 August 1913 in Navarro County, Texas, by license issued the 30th, with Christian minister Batsell Baxter officiating. The following appeared on 22 October 1915 in The Corsicana Semi-Weekly Light: This morning, Sheriff Pevehouse and Deputy Sheriff Seaton arrested and jailed Berkley Burris, a young white man, on a charge of burglary and he is now in jail. In May last, the home of Ross Ward, who lives just beyond the Zion's Rest community was entered and a lot of household goods, consisting of silverware, clothing, bedding, etc., were taken. Burris had been living with a brother-in-law, Mike Rector, in the same community, and the Rector house was searched and the stolen goods recovered. . . . Burris, who is just off the county farm where he was sent for stealing goods from a box car last spring, says he took the things from the Ward home, but that the house was open when he went in and got them. The following appeared on 9 June 1916 in The Corsicana Daily Sun: Mrs. Ross Ward, who lives north of town, underwent a delicate and dangerous operation at the P. and S. hospital late yesterday afternoon, and her condition today is as favorable as could be expected. 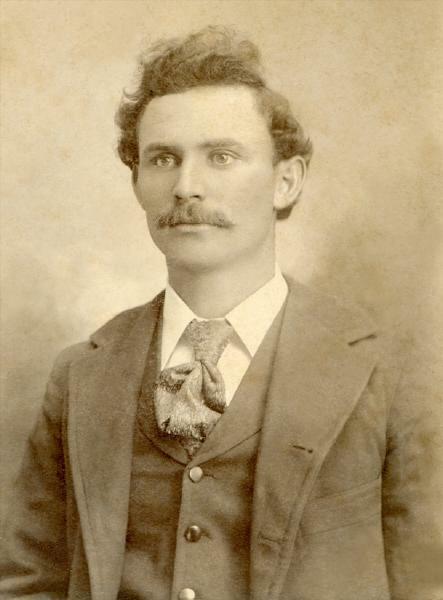 Ross S. Ward registered for the draft on 5 June 1917 in Ardmore, Carter County, Oklahoma, living in the Oklahoma oil boom town of Wirt, employed as a rig builder in the oil fields, married with dependent wife and child. Twins Rex and Ross Ward posed together in a photography studio for a playful photo, in contrast to tough times in the world and in their lives, likely not long before Rex left for his World War I military service. He served in the military during World War I, according to the 1930 census, but documenation has yet to be found. Ross S. Ward and Cora Mae Fife appeared in the US federal census of 1 January 1920 in Amarillo, Potter County, Texas, at 1510 Fillmore. Other members of the household included Mary Louise Ward. 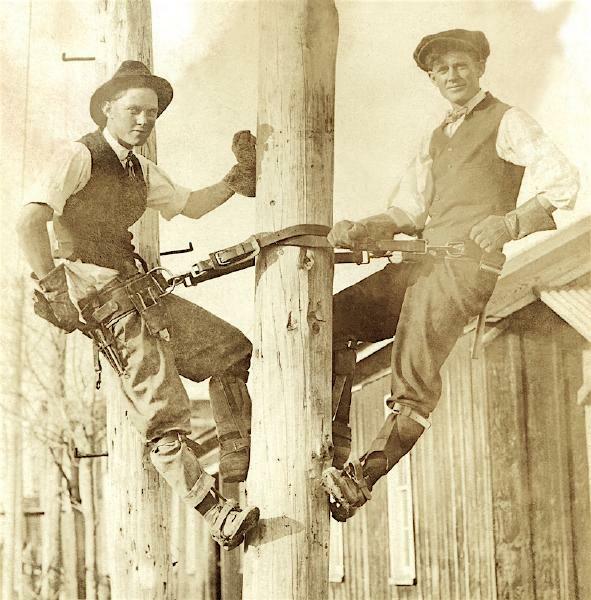 He was an oil field rig builder, according to the 1920 census. 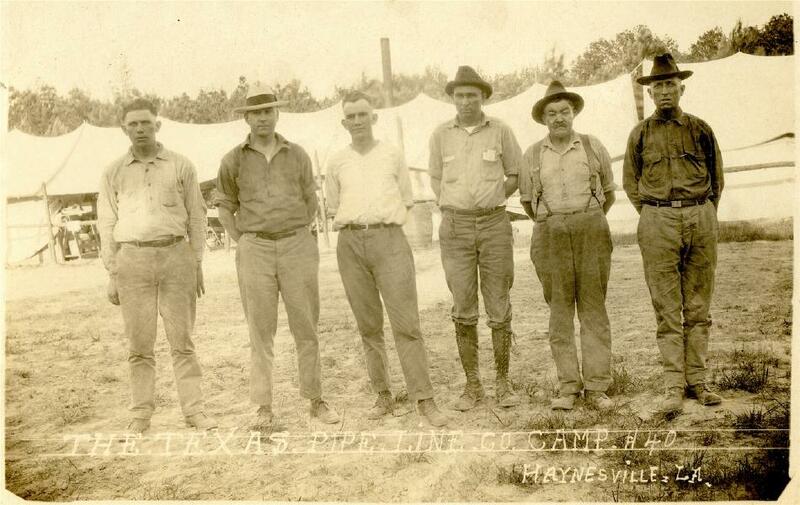 In a photograph titled "The Texas Pipe Line Co Camp H40, Haynesville, La," probably made in the late 1920s, Ross Ward is pictured on the far left, the others as yet unidentified. 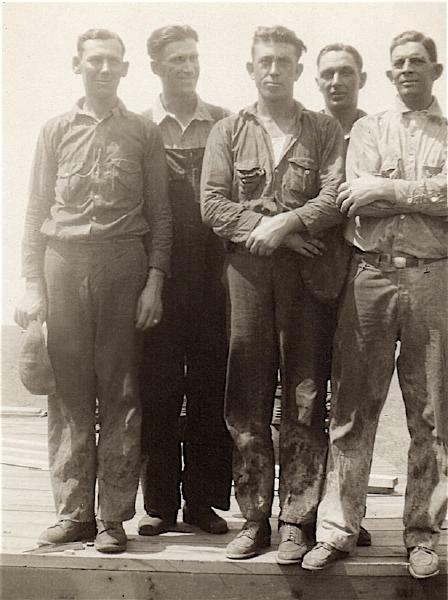 Ross Ward, center, was photographed four unidentified co-workers -- perhaps some his brothers (?). Ross Ward, center, pictured with four co-workers. Ross S. Ward and Cora Mae Fife appeared in the US federal census of 1 April 1930 in Amarillo, Potter County, Texas, at 413 East 11th Street. Other members of the household included Mary Louise Ward. He was a rig builder for an oil company, according to the 1930 census. The following appeared on 2 May 1932 in the Amarillo Globe-Times: Sixteen marriages and nine divorces were filed in Potter County for April, the records of the county and district clerks show. In the 108th district civil court the following divorces were granted last month: . . . Cora M. Ward from Ross Ward. . . He married Pearley Mae Nichols, daughter of John W. Nichols and Nancy Jane Beck. Ross S. Ward and Pearley Mae Nichols appeared in the US federal census of 1 April 1940 in Gaines County, Texas. He is identified as S. B. Ward, age 46, born in Pennsylvania. In 1935, both he and Pearl were living in Pampa, Gray County. He was employed as an oil field driller, according to the 1940 census. Ross S. Ward registered for the draft on 27 April 1942 in Yavapai County, Arizona, while living in Octave and employed there by the American Smelting & Refining Company. His name on the card is "S. B. Ross Ward," and he signed as "S. B. Ward," contact Mrs. Pearlie May Ward, also residing in Octave. The following appeared on 21 March 1946 in the Tucson Daily Citizen: For Sale--Come to Green Lantern Court, 25-ft. trailer with rugs and roaster, air-foam beds, ramada with chairs, green lawn with white fence. A clean home, priced right. Ross Ward. The following appeared on 19 December 1947 in the Tucson Daily Citizen: Lost--Western leather billfold, downtown, return papers, reward or keep money, Mrs. Ross Ward, 1800 Oracle Road, Green Lantern Court. According to a marginal notation in the Navarro County marriage book (August 1913, page 186), apparently a copy of the marriage record was, "Mailed to Ross Ward, Box 1001, Ruidoso, N. Mex, 1-30-58." Ross S. Ward became a widower at the 28 April 1972 death of his wife Pearley Mae Nichols. The SSDI lists Ruidoso, Lincoln County, New Mexico, as the last residence of record of Ross S. Ward. Ross S. Ward died on 21 September 1973 at age 80. The same birth year also appears in the Social Security Death Index.